When the day of the Junior Miss Bolton & Bury final arrived, I was up bright and early, ready to make my way to the venue, having packed all of my outfits for the four stages of the competition the night before. The day of the final was full of fun, we all practised on the catwalk in the morning and had pizza for lunch. Later we went off to carry on the rehearsals with a choreographer, to make sure we were each walking right and were in the right places. Later on, we were given time to do our hair and makeup, and after a quick photo in our evening wear outfits, we had to get changed into our eco outfits for the first walk. The theme for our Eco outfits was ‘fashion through the ages’, and I made a caged skirt, inspired by the underskirts they wore in the Victorian era, and I added paper flowers that I had made out of newspaper. I made a papier-mâché top and layered newspaper around one shoulder; this design was inspired by Princess Diana’s wedding dress. For the eco round, we all walked around together, then walked out one at a time, and introduced ourselves and the story behind our outfit. Next up was the sports round, where everyone wore sportswear either from a sport they did or a sport they were interested in. This covered gym styles, netballers, ballerinas, cheerleaders and much more. We all did the routine we had been practising earlier on in the day while walking down the catwalk. The third round was partywear, the type of thing you would wear on a Saturday night with friends. Then we hit the catwalk again. The final round was evening wear, I chose some fabric and a pattern then Khadija Ingar made my amazing dress, it was beyond what I expected, I was amazed. 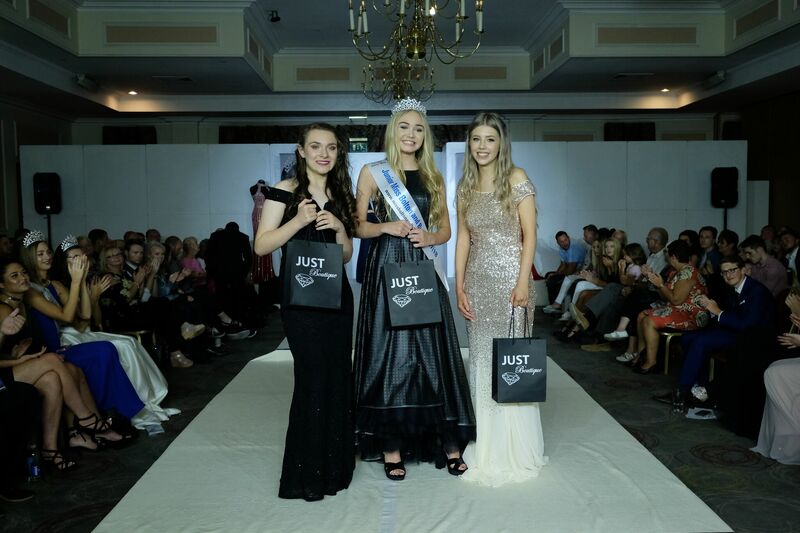 After each finalist walked the catwalk in our evening wear outfits, the judges made their decisions and awarded the sashes. Everyone sat backstage waiting as they called out the winner of each award, the sashes were all titled Junior Miss and were presented for Charity, Popularity, Personality & Community. Finally, the runners-up and the overall winner of Junior Miss Bolton & Bury was presented with the title, sash and crown. I was so excited when I heard my name called for Junior Miss Charity, then Junior Miss Eco and to my surprise Junior Miss Bolton and Bury 2017/18. The prizes were a photo shoot, a voucher for Just Boutique, and entry to Britain’s Junior Miss. It was an amazing experience and a lot of work, although I thoroughly enjoyed it, and now the hard work will start towards Britain’s Junior Miss, which is next summer.